The other day when my son and his girlfriend were making a huge plate of nachos, I thought, now there is a food I miss eating! I've always loved nachos, but while I am eating lower carb, corn chips just aren't a good choice. 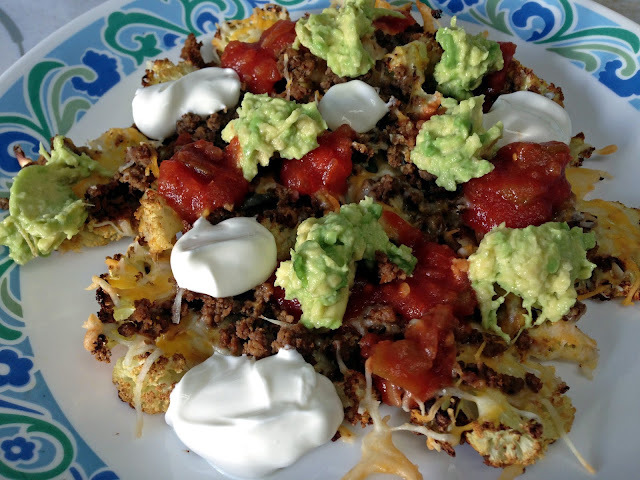 So I searched online for a healthier, lower carb option and found these: Cauliflower Nachos! You just cut up some raw cauliflower into thick slices and toss them with a drizzle of olive or avocado oil and a sprinkle of salt, paprika, chili powder, and cumin. Then roast them in a 425 degree oven for 35 minutes, top with cheese and cook another 5 minutes. You can add any nacho toppings you like: black olives, tomatoes, green onions, salsa, avocado, jalapenos, sour cream, and any kind of meat like shredded chicken, pork or beef. I used reduced fat shredded colby jack, lean cooked taco meat, sour cream, salsa, and guacamole. These were very satisfying and delicious. Using cauliflower instead of corn chips saves about 13 grams of carbs and 120 calories per serving, plus adds plenty of nutrition to your plate of nachos. I'm always looking for new ways to fit in healthy vegetables while lowering carbs. Do you have any ideas you'd like to share? whatever spices you like, garlic ect. roll between two sheets of parchment, bake at 350 then flip, top with yummy toppings, and bake some more. The last time I made it, I forgot the egg and it was really good. I make it when we make regular pizza for the kids...a few of the older ones prefer this version. 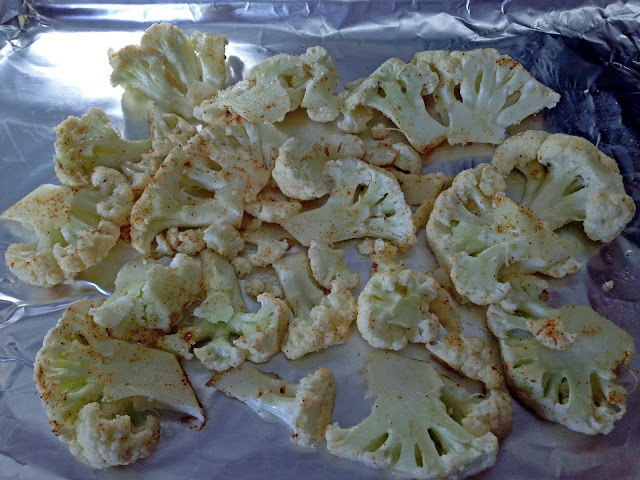 I also like to roast my veggies, like the cauliflower you did. Roasted baby kale with olive oil, salt, and pepper is superb, and the kids help me eat it all up. For me, it's helpful to gather things that I CAN eat, to make recipes and savory yummy stuff, otherwise I'll fall into the Poor Me, I Can't Eat Anything trap, and then I'll start in on having just a little of this and a little of that. So get prepared for battle, have tasty healthy food, and you won't feel as deprived. The cauliflower nachos look so good! I have found a lot of good low-carb recipes at butterisnotacarb.com. The Creamy Brussels Bake is one of my favorites. I make it a couple times a month. It looks like you're back on track. Congratulations! Please read my last blog post. It may be a cautionary tale that will motivate you to stay on track when those wobbly moments come. I've been where you are; you don't want to be where I am.